January 12, 2015 – Hyundai Motor Company, the fastest-growing automaker by brand, today staged a world premiere of Sonata Plug-in Hybrid, the company’s first Plug-in Hybrid Electric Vehicle (PHEV), and Santa Cruz crossover truck concept at the 2015 North International Auto Show, taking place at COBO Center, Detroit. The Hyundai Sonata Plug-in Hybrid Electric Vehicle (PHEV) is expected to travel up to 35.4km (22 miles) on electric power and can recharge in as little as two and a half hours with a Level 2 charger. Sonata Plug-in Hybrid will be built at the Asan, South Korea plant and will go on sale in select markets later this year. In addition, Hyundai Motor’s innovative Santa Cruz Crossover Truck Concept was also revealed at the show. This fresh concept reflects a completely new interpretation of truck utility for a new generation of buyers, especially Millennials, who represent the second-largest population of car buyers in the U.S. Although the Sonata Plug-in Hybrid is very technologically advanced, it will behave much like the regular Sonata Hybrid from the driver’s seat. A 9.8 kWh lithium polymer battery pack, roughly five times larger than the Sonata Hybrid’s battery, is expected to give Sonata Plug-in Hybrid an all-electric range of up to 35.4km (22 miles), farther than any other midsize PHEV sedan. 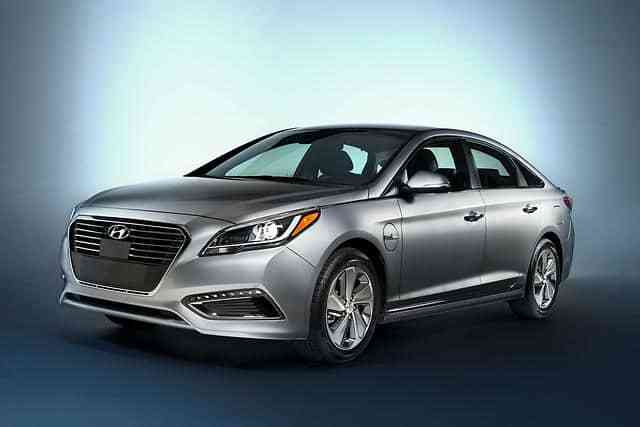 Sonata Plug-in Hybrid uses a six-speed automatic transmission with Hyundai’s Transmission-Mounted Electrical Device (TMED), a 50 kW electric motor, in place of a torque converter. The 50 kW electric motor is 32 percent more powerful than the motor used the in regular Sonata Hybrid and allows EV operation at higher speeds. A 2.0-liter Nu four-cylinder GDI engine coupled with the electric motor allows the Sonata Plug-in Hybrid to operate just like the Sonata Hybrid once the onboard battery charge is depleted. Sonata PHEV’s Nu engine produces 154 horsepower and 140 lb. ft. of torque and the total system output is 202 horsepower at 6,000 rpm. Sonata PHEV is expected to deliver 93 MPGe combined in EV mode based on internal estimates. In charge sustaining mode, the Sonata PHEV is expected to return 38 mpg in the city, 43 mpg on the highway and 40 mpg combined based on internal testing. Recharge time ranges from two and a half hours at a 240V Level 2 charging station to five hours using a standard 120V outlet. Sonata PHEV uses the same functional design changes as the Sonata Hybrid to improve its drag coefficient to a class-leading 0.24 as well as provide visual cues to distinguish the hybrid models from other Sonatas. Visual changes to the PHEV’s exterior include a charging port on the driver front fender, unique grille, front and rear bumpers, front fenders, front and rear lights, chrome side sill moldings, Hybrid badging and new wheels. A distinctive instrument cluster provides Plug-in Hybrid drivers with additional information about the PHEV system’s functions. A charge indicator is located on top of the dashboard to make it easy to see the state of charge from outside the vehicle. Owners can manage and monitor the Sonata Plug-In Hybrid Electric Vehicle remotely via an exclusive Blue Link smartphone app. With the app, owners can access real-time data from their Sonata PHEV and perform specific commands like starting the engine and locking doors. Plus, users can search for points of interest using Google with voice or text and have the directions when they start their Sonata PHEV. The most useful feature of the app is managing the car’s charging schedule. The owners are given vehicle charging options that they can select while in the car, but users can also manage them remotely via smartphone. Immediate charge is the simplest option, as charging begins as soon as the Sonata PHEV is plugged in. The Sonata Plug-in Hybrid comes standard with seven airbags, including a new driver’s knee airbag. Electronic Stability Control, Vehicle Stability Management, Traction Control, ABS and a Tire Pressure Monitoring System with individual tire pressure display, and a rearview camera are also standard. Projector headlamps are standard while HID headlamps are available. Hyundai engineers implemented many active safety technologies for the Sonata Plug-in Hybrid to assist drivers and help prevent accidents. No longer reserved for luxury cars, advanced safety technologies such as Forward Collision Warning and Lane Departure Warning are also available in this midsize sedan. Change Assist system determines the closing speed of any vehicle in the adjacent lane to determine if the lane change is safe. If the system determines the vehicle in the other lane is closing too quickly, it sounds an audible alarm to warn the driver that the lane change is unsafe. The Lane Departure Warning System uses a forward-facing camera to recognize lane markers. If the system detects the vehicle is headed outside the lane markers, a warning light on the dashboard illuminates and an audible sound alerts the driver. The Sonata Plug-in Hybrid delivers the convenient technology one would expect in a luxury vehicle in an incredibly efficient mid-size hybrid sedan. Hyundai’s hands-free Smart Trunk is standard on the Sonata Plug-in Hybrid. An electronic parking brake with automatic vehicle hold, a driver memory seat, heated steering wheel, LED interior lights, ventilated front seats, power front seats with 4-way adjustable driver lumbar and Smart Cruise Control featuring full stop capability are all available on Sonata Plug-in Hybrid. * Specs and trims may differ depending on markets. * More specifics and details will be available closer to each market’s launch. Modern urbanization is impacting the market in a broad way, and this trend is especially strong with young adults, who face tighter parking on streets and parking garages, and increasing congestion overall. These trends are not confined to one specific region of the U.S.; they’re happening in urban hubs everywhere. These “Urban Adventurers” have a different mindset, being very active both socially, and in their communities, bringing a pioneering spirit to make their neighborhoods a better place to live and work. So whether it’s loading up friends and firewood for a bonfire at the beach, coaching the youth soccer team, volunteering for a community restoration project, or a quick drop-off at the local recycling center, they need a vehicle versatile enough to accommodate both passengers and gear, while being efficient enough to fit into their unique urban lifestyle. To meet the specific needs of these Urban Adventurers, Santa Cruz doesn’t focus on all the same attributes as traditional pickups. It’s designed to meet more of their desires for expression, efficiency and maneuverability. Hyundai designers created a bold design that conveys this lifestyle, with a wide, sure-footed stance and an aggressive side-profile rake. The front view features an upright, hexagonal grille with cascading lines framing the sides, dual lens-free, honeycombed headlamp projectors, and prominent LED fog lamps. The side profile is highlighted by oversized wheels, Michelin® tires with a special tread design, center-locking hubs and yellow Brembo® brake calipers. For ease of access to the rear seats, Santa Cruz features convenient, rear-hinged rear doors which integrate seamlessly with the front door design. The wheel arches, roof, and bed rails offer convenient tie-down cleats for securing cargo of all shapes and sizes. From the rear, the concept presents highly-contoured bed forms, and for extra utility, the expandable bed can be easily reconfigured for longer cargo, using a unique drawer-like sliding function. Efficiency is a key attribute of its advanced powertrains, with an environmentally-friendly 2.0-liter turbo diesel powertrain delivering 190 horsepower and 300 lb.-ft. of torque, while achieving fuel economy in the high 30 mpg range. Santa Cruz also offers Hyundai’s HTRAC® All-wheel drive system, so there’s no anxiety about getting those snowboarding “fresh tracks” right after a storm moves through. The concept is purposefully compact, and although it has four doors and seating for five, its overall footprint is similar to a small CUV. These dimensions make it ideal for navigating the urban jungle or a tight parking spot that most pickup drivers often have to pass by. It offers typical CUV driving character, but with a versatile cargo bed that provides separated storage for all they want to bring along, whether it’s a trip to the recycling center, a surf or paddleboard session, or a couple of mountain bikes for the trails. Whatever the day’s activity might bring -- all that dirty, sweaty, wet, sandy, bulky gear remains in the back of the truck, cleanly separated from the passenger compartment. Sometimes, there are those needs that call for even more cargo room; that’s why Santa Cruz offers an innovative tailgate extension that allows the bed length to be expanded whenever those “just in case” moments arise. The extension is perfect for everything from an epic mountain bike trip to bringing home an antique chest or classic motorcycle that’s ripe for restoration. When fully extended, Santa Cruz’s bed length is similar to a mid-size pickup, providing the ability to carry much more than its compact footprint would suggest, yet only when needed. Santa Cruz was designed to accommodate whatever the Urban Adventurer’s lifestyle calls for, whether expected or unexpected. Some of the industry’s past attempts to blend truck-bed flexibility with passenger-car attributes were limited because they didn’t deliver the practical benefits the customer expected. Most tried to straddle the line by attracting traditional truck buyers with compromised products at a similar price point, failing to deliver any differentiating benefits. Santa Cruz, by design, isn’t an alternative to a truck, so towing, payload and ground clearance were not primary goals. Rather, Santa Cruz is intended to attract CUV and sedan buyers who are seeking greater utility, without the compromises that traditional trucks often require. Hyundai research revealed that not everyone who wants an open-bed vehicle is willing to accept the tradeoffs that come with it. As evidence of this, industry pickup truck share is down over five percent in the last 10 years, with the biggest shift among young adults, reflecting a need for something that more closely matches these morphing lifestyles. In the past, small trucks accounted for half of pickup sales, and they were particularly popular with younger buyers. Today, that same young truck market is almost non-existent, and millennials under 30 represent just seven percent of all pickup purchases. Women, who buy more than half of all CUVs sold, now account for only 10 percent of pickup sales. Santa Cruz is intended to meet the customer needs that the current truck product offering is simply not fulfilling. Santa Cruz is for the growing population who sees and pursues the world differently, those who want all the traditional attributes of a small CUV, but need the day-to-day versatility of an open bed. It’s the crossover truck that meets the unspoken needs of Urban Adventurers.